This incredible luxury villa is situated in the exceptional region of Mougins. 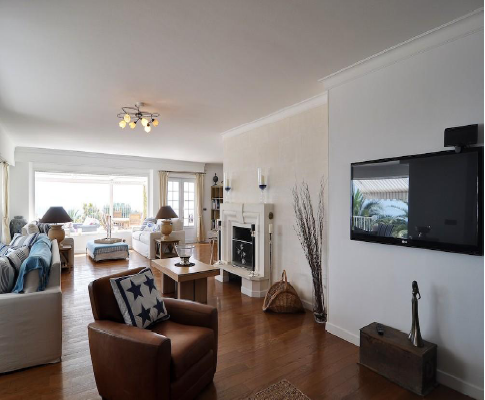 The property has beautiful views over the Bay of Cannes and the Mediterranean Sea from its hilltop location. The sandy beaches of the French Riviera are just a short 15-minute journey from the villa. Surrounded by seemingly endless terraces and a swimming pool with its own pool house to match the top hotels of the world, this immaculate property provides its guests with the ultimate level of luxury and comfort. The terraced grounds include several lawn areas where guests can partake in games of boules as well as enjoy the fresh produce grown in the organic herb and vegetable garden. The lower sun terrace has been equipped with a summer kitchen, a bar area and the swimming pool complete with a sunken Jacuzzi. Each terrace has a sweeping staircase to allow guests to transport from each level with ease. The second terrace level features an elegant fountain and a tented gazebo with the top terrace furnished with outdoor seating and integrated awnings for shade. The tastefully decorated interiors of the property are spacious and well presented. Whites and pastels are accented with pops of colour on the cushions and lampshades. No expense has been spared with all furniture and art work of the highest quality. The L-shaped open plan living room is divided into distinct sections with a comfortable seating area, a bar and more seating grouped around the unique fireplace. The formal dining room is located to the left of the entrance hall and also includes a feature fireplace. Adjacent to the entrance hall is the fully fitted professional kitchen completed with all the latest appliances. The first floor of the villa is where guests will find the exquisite master bedroom featuring an en-suite bathroom, a Jacuzzi and a power jet shower. There is also a seating area and access to a private terrace with a hot tub. There are 2 interconnecting twin bedrooms on this floor, sharing a shower room and a private balcony with sea views. These bedrooms are perfect for children and younger guests. All bedrooms include satellite television and plasma screens. The garden level of the property includes 5 en-suite bedrooms, 3 of these being super-kings, a super-king suite and a twin. A fantastic games room/TV lounge is also located on this level and incorporates a pool table, table tennis, table football and a large seating area. A separate area beneath the pool terrace is where guests will find a state-of-the-art cinema room with surround sound and a temperature controlled wine cellar. This room opens onto the gardens. Situated to the side of the villa is a fabulously luxurious spa facility with a fully fitted gym, a hammam, a sauna and a Jacuzzi. There is also an 11-metre lap swimming pool, 3 massage rooms, a relaxation area and male/female changing rooms. The property also features a 2-bedroom guest apartment comprising of a sitting room, a kitchen and a shower room. Spa Facilities – Sauna, Hammam & Massage Rooms.